The home of Hammocks Beach State Park and its unspoiled beaches, Swansboro boasts a beautiful small harbor adjacent to the Intracoastal Waterway and is only three miles from coastal recreational facilities in the Croatan National Forest. 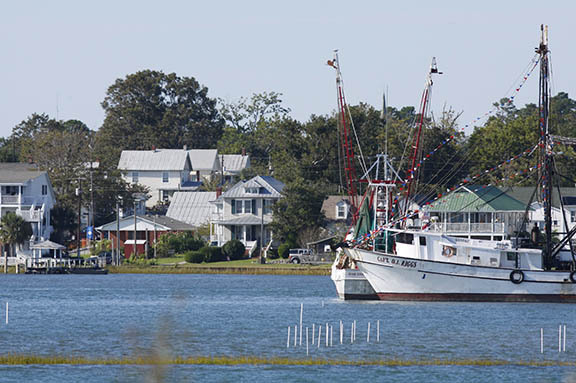 The unique village atmosphere in Swansboro’s historic downtown area offers opportunity to enjoy the community’s heritage while shopping in an area alive with restaurants, boutiques, gift shops, and waterside parks. Host to a wide variety of major events – from the Arts by the Sea Festival, the Mullet Festival, Candlelight Shopping, and the Christmas Flotilla to an annual Oyster Roast, an annual Pig Cook-Off, the Blue Water Fishing Tournament, the King Mackerel Tournament, and the Speckled Trout Tournament – Swansboro offers some of the best hospitality on the North Carolina coast. Popular activities available in Swansboro and the surrounding area include beach-going, fishing, boating, camping, kayaking, golf, shopping, the arts, and amusement parks. Known as a high-quality living location, Swansboro offers a wide variety of residential settings – many of which are located on or near the White Oak River, the Intracoastal Waterway, or the numerous coastal creeks that border the town – and an attractive array of business services. Settlers first came to Swansboro around 1730, founding a community on the site of an Algonkian Indian village at the mouth of the White Oak River. The colonial port town of Swannsborough was incorporated in 1783 – named in honor of Samuel Swann, who had been speaker of the North Carolina House of Commons. The community’s early prosperity was based on shipbuilding, and its most famous shipbuilder was Captain Otway Burns. Burns, whose exploits as commander of the privateer vessel Snapdragon brought early attention to Swansboro, was also the builder of the Prometheus, the first steamboat constructed in North Carolina. Although its shipbuilding industry declined, Swansboro found new prosperity in lumber and naval stores, and, in the mid-Twentieth Century, in the commercial fishing industry. Beginning with World War II, Swansboro, like most of Onslow County, began experiencing an economic boost from the nearby establishment of Camp Lejeune, one of the U.S. Marine Corps’ largest bases, and from the growth of coastal tourism – trends that continue today. With its remarkable heritage, scenic views, great hospitality, and casual lifestyle, Swansboro has retained the quiet charm and unique character of a picturesque colonial port – making it an outstanding community for anyone who wants to join the “Friendly City” tradition to call “home” offers a historic downtown district overlooking the water, numerous opportunities for coastal recreation, and a progressive town government that works to balance high quality community growth with conservation of the community’s natural and historic resources. Waxhaw takes its name from the Waxhaws, named after the historic American Indian tribe that inhabited the region. The community was settled by European-Americans in the mid-1700s, of mostly German and Scots-Irish origin. They became subsistence farmers and were known for being independent. Andrew Jackson, seventh President of the United States, was born nearby in 1767. There is some disagreement as to which of the Carolinas was his birthplace, due to the proximity of the border. The arrival of the railroad in 1901, with access to the markets of Atlanta, helped the town reach prosperity. The tracks were laid directly through the center of town, showing the importance of the railroad. They remain on the street, now bordered by a green, grassy strip dividing the rows of stores on each side. Beginning in the late 1800s, the community was developed with cotton mills for manufacturing textiles. The railroad helped increase access for its products. Cotton manufacturing was important to the region through the 1940s. Postwar changes in the economy, with shifts of the textile industry to jobs to other areas and out of the country, required the community to adapt to new conditions. Waxhaw has evolved as an antique and fine dining center. Its Small Town Main Street committee is working on an integrated approach to developing and marketing the historic center of town. The Town currently has dozens of specialty shops and dining ranging from mom & pop restaurants to fine dining bistros. The Waxhaw Historic District is on the National Register of Historic Places. It includes retail businesses as well as architecturally significant houses near the center of town. Residents and town government are working on additional improvement plans. The Town Park is located in the downtown area, as is a Skate Park for youths and skateboarding. New housing has been built along NC 75 to the east and west of town, as well as Hwy 16 to the north. Near Waxhaw is Cane Creek Park, a 1,050-acre (4.2 km2) park, featuring scenic areas and recreation activities. The facility, on Harkey Road south of Waxhaw, was a cooperative venture between Union County, the Union Conservation District and the Soil Conservation Service of the U.S. Department of Agriculture. So what setting, geography, and lifestyle have to be present to make a place in the Carolinas a Best Place for you to live?! Well, today I’m going to share with you some of my best places in North Carolina based purely on setting, geography, and lifestyle. I’m a mountain man myself. I grew up near the ocean and I’m tired of the hot sun and flat scrubby coastal land of the northeast and southeast. So for me, the mountains of western North Carolina are a refreshing magnificent change. But I still will tell you about some incredible coastal areas, for those of you who still want to be on the water, and don’t forget those pure, crystal clear, cold as ice mountain lakes. So off to the Mountains…I love the areas of Asheville, Waynesville, Cashiers, and Chimney Rock. Asheville has only about 80,000 people, but it’s very hip with plenty of services, a major hospital and airport. Waynesville has about 30,000 people in the greater area. And if you love living at severe angles on the side of a mountain with incredible long mountain views, Waynesville’s for you. Visit Chimney Rock south of Asheville, hike the trails and enjoy the hawks, vistas, and views of Lake Lure. Check out the waterfalls at Graveyard Fields off the Blue Ridge Parkway and take a dip in some crisp, clear, mountain springs. 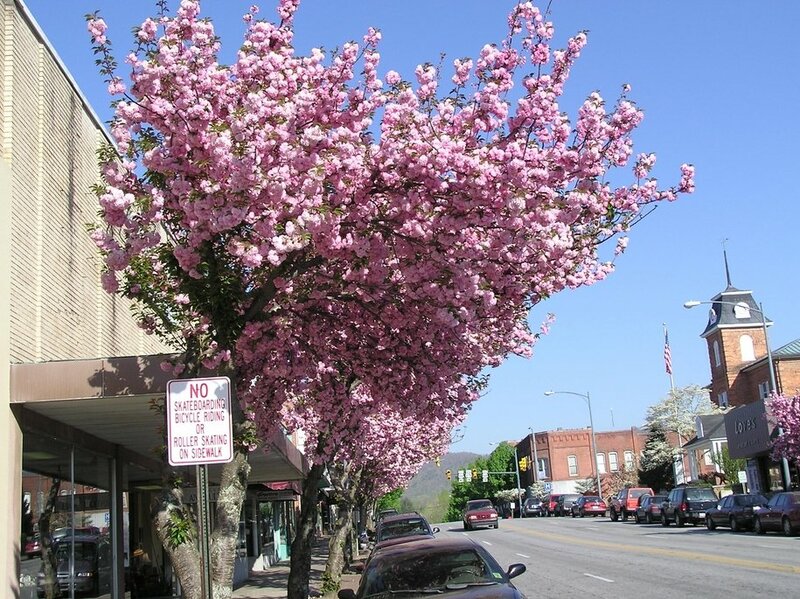 Downtown Brevard is the crossroads between Pisgah National Forest, Dupont State Forest, Gorges State Park, and Bracken Mountain Nature Reserve. These are ideal for: hiking, biking, fishing, kayaking, and climbing. For 72 years Brevard has been home to the world-renowned Brevard Music Center. Downtown Brevard is also home to The Porter Center of Performing Arts (Brevard College) and the Transylvania Community Arts Council, which both bring diverse programs, concerts, and exhibits to our mountain community. The Heart of Brevard has teamed together with Transylvania Arts Promotion (TAP), in order to produce The Arts Directory of Transylvania County. Four annual street festivals capture our hometown feeling: White Squirrel Festival, Fourth of July Celebration, Halloweenfest, and Twilight Tour. Other special events include: Annual Squirrel Box Derby, Old Time Music Competition, Valentine Get-Away Weekend, and Main Street Alive. They’re just a part of why people visit City of Brevard, Land of Waterfalls, Transylvania County. Before we begin, I need to make sure you understand what I mean by “Small Town America.” I do NOT mean “America” as in “North America,” “South America,” “Central America.” And I do NOT mean the “United States of America” (also known as United States, United States of America, America, the States, US, U.S., USA, U.S.A.), a political republic comprising 50 states. I’m referring to the social, historical and physical conditions that form the basis of lives people actually lead in small towns, and upon which everything else rests, especially the political entity, United States of America. Due to the practical conditions of time and money, I only visited small towns in what is referred to as the “Continental United States,” also known as the “Lower 48,” which refers to the 48 states located on the North American continent plus the District of Columbia, but excludes the states of Alaska and Hawaii and all off-shore U.S. territories and possessions, such as Puerto Rico. 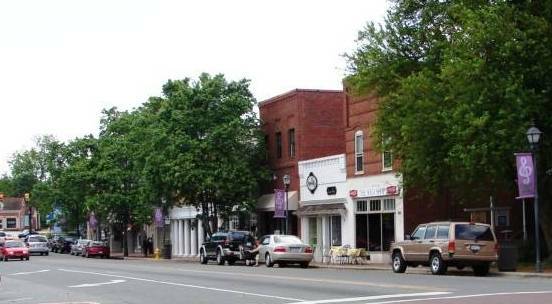 Davidson is among eight designated “North Carolina Main Street” communities that will get federal Recovery Act money for energy efficiency projects, Gov. Beverly Perdue’s office announced Tuesday. The town has received two grants totaling more than $19,000 for two projects – one at town hall and one in partnership with the Business Center @ South Main Square. The town will get $5,300 to replace all overhead lighting in the Davidson Town Hall and in the Davidson Fire Station with energy efficient fluorescent fixtures. The project also includes replacing all incandescent bulbs with compact fluorescent mini-spirals, which should bring a 43 percent energy cost reduction, the governor’s office said. The town will match the grant with money from Duke Energy’s Smart Saver Energy Plan and its operating budget. A second grant of $13,767 will go to a partnership of the town and Urban Organic I LLC, to achieve EPA Energy Star certification of the Business Center @ South Main Square. Urban Organic will provide matching funds. The project will replace manual thermostats with electronic programmable ones, and replace an existing enthalpy controller with a new electronic controller, which is expected to save $750 annually.